April 24th - May 3rd 2017 : Luka Grubišić and Josip Tambaca (both University of Zagreb) are guest. Josip Tambaca gives a presentation on April 25th and Luka Grubišić on April 28th in the colloquium of the modeling, numerics, differential equations group. December 8th-9th, 2016: Holger Heumann (INRIA Sophia / Université Nice - Sophia Antipolis) is guest of the junior research group. July 18th-22nd, 2016: Kersten Schmidt organises jointly with Agnes Lamacz (TU Dortmund) the minisymposia "Multiscale and Homogenization Methods: Interplay of analysis and numerics with a focus on wave problems" at 7ECM in Berlin. February 17,2016: The MATHEON Multiscale Seminar continues with talks by Nicola Popovic (Universität Edinburgh) und Martin Heida (WIAS Berlin). The seminar starts at 9.15 a.m. in MA 313. December 11th, 2015: The MATHEON Multiscale Seminar continues with talks by Ralf Kornhuber (FU Berlin) and Dirk Pauly (Universität Duisburg-Essen). The seminar starts at 9.15 a.m. in MA 313. December 1st, 2015: Our guest Patrick Joly gives a talk at the colloquium of the modeling, numerics, differential equations group. It starts at 4.15 p.m. in MA 313. November 1st, 2015: Sergiy Nesenenko starts as research associate in the junior research group. October 30th, 2015: The MATHEON Multiscale Seminar continues with talks by Agnes Lamacz (TU Dortmund) and Adrien Semin (TU Berlin). The seminar starts at 9.15 a.m. in MA 313. October 2015: Kersten Schmidt gives the lecture Numerics of partial differential equations in winter term 2015/2016. It starts on Monday, October 12th at 2.15 p.m. in MA 550. October 2015: The lecture Asymptotic analysis in winter term 2015/2016 is cancelled. Instead it will be given in summer term 2016. 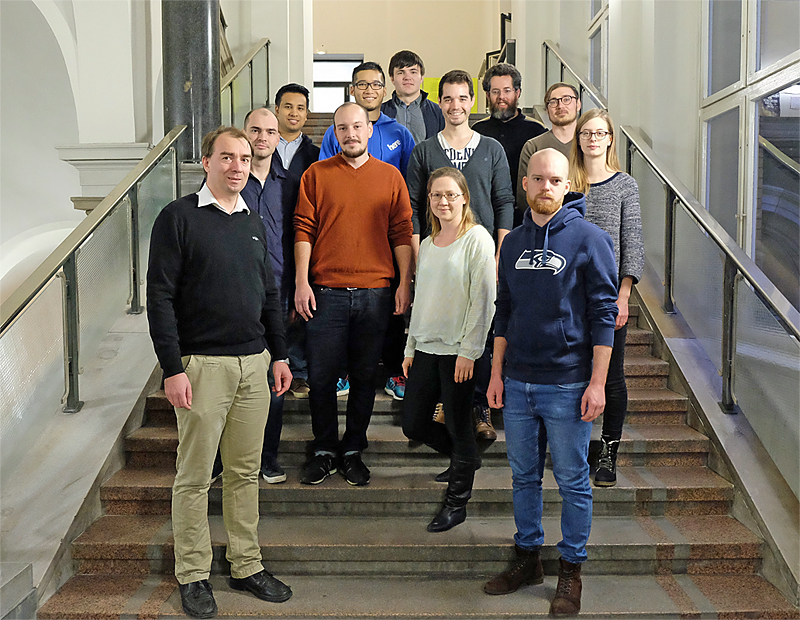 July 15th, 2015: The MATHEON Multiscale Seminar continues with talks by Patrik Marschalik (Universität Mainz) and Andreas Münch (University of Oxford). The seminar starts at 9.15 a.m. in MA 313. June 24th, 2015: Kersten Schmidt and Adrien Semin present their work in collaboration with Bérangère Delourme (Université Paris 13) through a technical report (available here). March 17th, 2015: Kersten Schmidt gives a talk "Unsichtbare elektrische Felder - können wir sie aufdecken" at Urania Berlin within the Matheon programme MathInside for highschool sudents (schedule). January 7th, 2015: We moved into new offices. You now find us in the third floor of the maths building in rooms 363 and 365. December 3rd, 2014: There will be another session of the MATHEON Multiscale Seminar. September 15th-19th, 2014: Anastasia Thöns-Zueva and Kersten Schmidt present their research results at the conference BAIL 2014 in Prague. August 28th - September 5th, 2014: Bérangère Delourme (Université Paris 13) is guest of the junior research group. July 23rd, 2014: Kersten Schmidt gives a talk on "Interior penalty finite element methods for high-order local boundary conditions" at WCCM XI in Barcelona. July 20th-25th, 2014: Kersten Schmidt organises jointly with Hélène Barucq and Rabia Djellouli the minisymposia "Advanced Computational Techniques in Geophysical sciences" at WCCM XI in Barcelona. July 15th-18th, 2014: Kersten Schmidt and Robert Gruhlke present their work on higher order finite element methods at HOFEIM 2014. July 7th, 2014: Sergiy Nesenenko (Universität Duisburg-Essen) and Barbara Wagner (TU Berlin) will present their work on multiscale methods for partial differential equations in the MATHEON Multiscale Seminar at 9.15 am in MA 415. June 11th, 2014: Kersten Schmidt gives a talk on "Symmetric local absorbing boundary conditions for the Helmholtz equation" at the Langenbach Seminar at WIAS Berlin. May 23rd, 2014: Kersten Schmidt presents his work on "Numerical analysis of boundary element methods for impedance transmission conditions" at University of Basel. April 2014: Kersten Schmidt gives the lecture Asymptotic Analysis 2 in summer term 2014. It starts on Wednesday, April 16th at 12.15 am in MA 542. April 2014: Dirk Klindworth reads the lecture Introduction to the Finite Element Method in summer term 2014. It starts on Tuesday, April 15th at 10.15 am in MA 545. February 24th-28th, 2014: Bérangère Delourme (Université Paris 13) is guest of the junior research group. February 4th, 2014: Kersten Schmidt gives a talk on "Local impedance boundary conditions for wave propagation in viscous gases" at the Colloquium of the Modeling, Numerics, Differential Equations Group at TU Berlin. The talk starts at 4.15 pm in room MA 313. November 18th-22nd, 2013: Victor Peron (INRIA Bordeaux Sud Ouest / Université de Pau) is guest of the junior research group. October 2013: Kersten Schmidt gives the lecture Asymptotic Analysis in winter term 2013/2014. It starts on Friday, October 18th at 10.15 am in MA 143. October 1st-3rd, 2013: Carlos Jerez-Hanckes (Pontificia Universidad Católica de Chile) is guest of the junior research group. September 2nd-6th, 2013: Bérangère Delourme (Université Paris 13) is guest of the junior research group. August 26th-30th, 2013: Kersten Schmidt and Adrien Semin present their latest research results at the Singular Days 2013 in Rennes (France). July 9th, 2013: Our guest Holger Brandsmeier (ETH Zürich) presents is work on "Generalized FEM for wave propagation in periodic structures" at the Colloquium of the Modeling, Numerics, Differential Equations Group. June 30th - July 4th, 2013: At COMPUMAG 2013 in Budapest Kersten Schmidt gives a talk on "Robust transmission conditions of high order for thin conducting sheets in two dimensions" and presents posters on the topics "Dirichlet-to-Neumann transparent boundary conditions for photonic crystal wave-guides" and "Asymptotic boundary element methods for thin conducting sheets in two dimensions". June 27th, 2013: The MATHEON Multiscale Seminar continues with talks by Stefan Neukamm (WIAS), Maria Bruna (University of Oxford) and Adrien Semin (TU Berlin). The seminar starts at 9.00 am in MA 415. June 17th, 2013: Kersten Schmidt gives a talk on "Highly accurate impedance boundary conditions for thin conducting sheets" in the CE Seminar at TU Darmstadt. June 3rd-7th, 2013: Anastasia Thöns-Zueva, Dirk Klindworth, Kersten Schmidt and Adrien Semin present their recent results at WAVES 2013 in Gammarth (Tunesia). May 24th, 2013: The junior research group takes part in the sports event "12. Berliner Firmenlauf" (photo). May 16th, 2013: Kersten Schmidt gives an invited talk on "Transmission conditions for thin conducting sheets within the eddy current model" at the IFIP TC7.2 Workshop "Electromagnetics — Modelling, Simulation, Control and Industrial Applications" at WIAS Berlin. May 8th, 2013: Julien Diaz (INRIA Bordeaux Sud Ouest / Université de Pau) is guest of the junior research group. May 1st, 2013: Maxim Zeinaliyev starts as student assistant in the junior research group. April 11th, 2013: Kersten Schmidt gives an invited talk on "Modelling of guided modes in photonic crystal wave-guides" at the MASOMO 2013 workshop at WIAS Berlin. April 10th, 2013: Dirk Klindworth speaks at the MASOMO 2013 workshop at WIAS Berlin about his work on "An efficient calculation of photonic crystal band structures using Taylor expansions". April 8th, 2013: Alexander Mielke (WIAS) and Carsten Hartmann (FU) give a talk at the MATHEON Multiscale Seminar (2.15pm in MA 313). February 22nd, 2013: Kersten Schmidt gives an invited talk on "Modelling of photonic crystal waveguide modes" at the 6th Annual Meeting Photonic Devices at Zuse-Institut Berlin. February 22nd, 2013: Dirk Klindworth presents his work on "An efficient calculation of photonic crystal band structures using Taylor expansions" at the 6th Annual Meeting Photonic Devices at Zuse-Institut Berlin. February 19th, 2013: Yaohui Chen (Technical University of Denmark) is guest of the junior research group. January 29th, 2013: Carlos Jerez-Hanckes (Pontificia Universidad Católica de Chile) is guest of the junior research group. January 24th, 2013: Maciek Korzec (TU Berlin) speaks about "Multiple scales in silicon type microstructure growth" in the MATHEON Multiscale Seminar at 9.30 am in MA 415. Afterwards Thomas Petzold (WIAS) will present his research on "Modelling and simulation of multi-frequency induction hardening of steel parts". October 29th, 2012: Kersten Schmidt presents his work on "High Order Asymptotic Expansion for Viscous Acoustic Equations Close to Rigid Walls" at the Aquitanie-Euskadi Workshop on Applied Mathematics in Biarritz (France). October 24th, 2012: The Einstein International Postdoctoral Fellow Adrien Semin starts as research associate at the junior research group. More information on the Einstein foundation and the Einstein International Postdoctoral Fellow program can be found here. October 22nd, 2012: Juliette Chabassier (INRIA Bordeaux Sud Ouest / Université de Pau) is guest of the junior research group for four weeks. September 11th, 2012: Kersten Schmidt present his work on "Robust transmission conditions of high order for thin conducting sheets" at the SCEE2012 conference at ETH Zürich. July 31st, 2012: At the CMAM-5 at HU Berlin Dirk Klindworth presents "A mixed variational formulation approach for Dirichlet-to-Neumann operators in periodic media". July 30th, 2012: Kersten Schmidt gives a talk about "A boundary element method for impedance transmission conditions related to thin conducting sheets" at the CMAM-5 at HU Berlin. July 3rd, 2012: Dirk Klindworth presents about "Exact computation of guided modes in photonic crystal wave-guides using Dirichlet-to-Neumann operators" at the 8th Workshop on Numerical Methods for Optical Nano Structures at ETH Zurich. June 12th, 2012: Kersten Schmidt gives a talk on "Asymptotic modelling of acoustic wave-propagation in viscous gases" at the seminar "Nonlinear optimization and inverse problems" at WIAS. May 4th, 2012: Roman Kappeler (ETH Zurich) is guest of the junior research group. 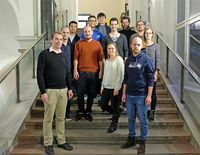 April 20th, 2012: "A MATHEON Multiscale Workshop" takes place at TU Berlin (organised with Daniel Peterseim, HU Berlin). April 2012: In summer term 2012 Kersten Schmidt gives the lecture "Numerical Analysis and Finite Elements for Electromagnetics and Wave Propagation" at TU Berlin. February 24th, 2012: Dirk Klindworth gives a talk on "Computation of Guided Modes in Photonic Crystal Wave-Guides" at the MATHEON-Workshop "5th Annual Meeting Photonic Devices" at Zuse Institute Berlin. December 12th-16th, 2011: Participation on the Workshop "Numerical Analysis of Multiscale Problems & Stochastic Modelling" inside the RICAM-Special Semester on"Multiscale Simulation & Analysis in Energy and the Environment". December 6th, 2011: Procope-Project for exchange with the INRIA group "MAGIQUE 3D" (University Pau, France) is approved by the DAAD. October 2011: Together with Barbara Wagner, Kersten Schmidt organizes the seminar "thin films" in winter term 2011/2012 at TU Berlin. October 2011: Anastasia Thöns-Zueva starts as research associate in the junior research group. September 20th, 2011: Kersten Schmidt gives a talk on "Modelling of photonic crystal wave-guide modes" at the minisymposia "Analysis und Simulation von Nanostrukturen" of the Jahrestagung der Deutschen Mathematiker-Vereinigung in Cologne. July 25th, 2011: Kersten Schmidt speaks about "Robust transmission conditions of high-order for thin conducting sheets" at the Waves'11 conference in Vancouver. July 2011: Xavier Claeys (ISAE Toulouse) is guest of the junior research group. June 1st, 2011: Kersten Schmidt gives a talk on "High order transmission conditions for conductive thin sheets" at the Langenbach Seminar at Weierstraß-Institut Berlin. April - June 2011: Anastasia Thöns-Zueva is guest of the junior research group. April 2011: In summer term 2011 Kersten Schmidt gives the lecture "Numerics of partial differential equations" at TU Berlin. April 2011: Dirk Klindworth starts as research associate in the junior research group. March 2011: Christian Heier and Robert Gruhlke start as student assistants in the junior research group. February 18th, 2011: Kersten Schmidt is invited speaker at the Matheon workshop "4th Annual Meeting Photonic Devices" in Berlin. February - March 2011: Mengyu Wang (ETH Zürich) is guest of the junior research group.